Back in about 1999 I picked up a Bootleg Mobb Deep 12" from London's now closed down Mr Bongos. I've always been partial to a nice bit of Havoc and Prodigy especially if its Havoc behind the boards. I like the dark ominous production style that Havoc fathered and their style of morbidly threatening raps has always cheered me up. At the time I had only heard 3 the Hard way and Gun Love on a couple of mixtapes and had liked what I heard despite the wack DJ shouting all over the tracks. So of course being a big QB fan I had to grab this bootleg 12"
The beat is made up a of a Claudja Barry sample taken from the track Love For The Sake Of Love from her 1976 album Sweet Dynamite. 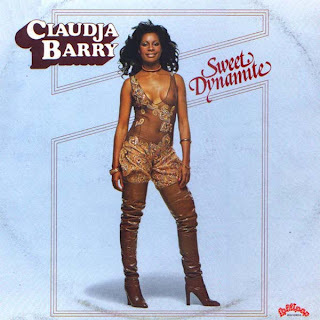 Claudja Barry was at one time a member of Boney M and was a well respected Disco artist in the mid seventies. The beat isn't the usual dark and suspenseful Havoc produced joint but a rather up beat and almost happy joint, which I guess is Mobb showing how ironic they can be. The rest of this bootleg is taken up with some rather unusual tracks. Flippin is on the A side along with the above mentioned Gun Love and is a pretty run of the mill Mobb track with what sounds like Big Noyd dropping some lyrics but as its a bootleg I can't be sure as there is no credits. The first track on the B Side is 3 the Hard way which is a dope track. It has a cool guitar loop with lots of static over it. Its a little short for my liking but I'm sure there is a full version out there somewhere. Once again I think I hear Noyd on this but I'm not 100% sure. The last track on this is terrible it has Mobb Deep rapping over a an upbeat piano loop that by the end of the track turns into Pavarotti's Nestle Dormer, I think with Pavarotti singing included. Its so wrong for so many reasons and its abruptly cut short. Mick email me dude and we'll talk. I'd be eternally grateful for a rip of this dude. hi mate. i've tried downloading this a million times but zshare just wont work. is there any chance you can upload this to another website? i'm desperate for the single version of gun love!